Come and join us for Hochelaga Records’ first album release party! 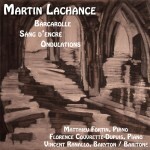 This new recording contains three of my works performed by Matthieu Fortin (piano), Florence Couvrette-Dupuis (piano) et Vincent Ranallo (baryton). Three new music videos of these works will also be shown in the evening. Directed by Atomique Films’ Hugues Tremblay, the videos will be shown in World Premiere.